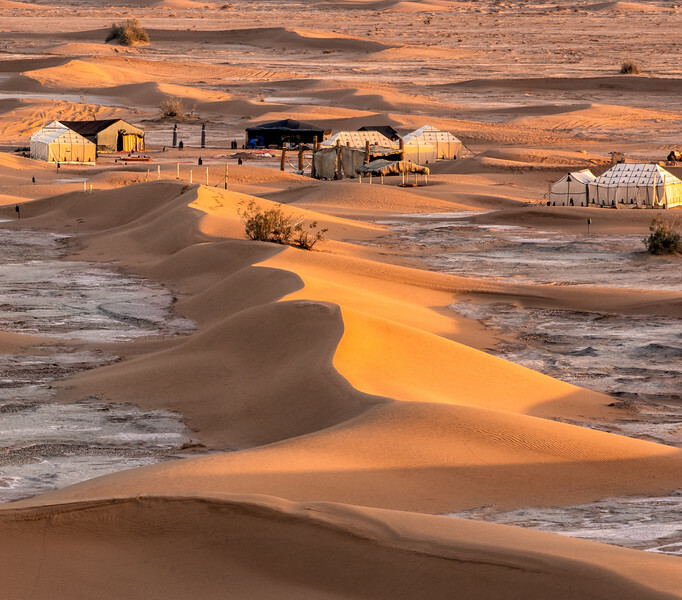 The addition of the Sahara Desert to our Morocco itinerary was a last minute decision as I came across information about the Erg Chigaga Luxury Desert Camp. I recall in my early correspondence with Nick Garsten, one of the owners, being corrected when I mistakenly called the camp a “resort”. While not a resort, it seems to be about as comfortable as you can be almost 3 hours into the Sahara Desert. The large tents had king size beds, extra seating, and an adjoining tent with “bathroom” facilities. We did make a rookie mistake our first night by leaving our luggage open while at dinner and were greeted with a famous Sahara sandstorm. I think we are still carrying a piece of the Sahara with us in the corners of our luggage. Although the natural beauty is striking, as seen in the following images, my favorite moment was spending an afternoon hearing Bobo, the other owner, tell his inspiring story. Bobo was born in the Sahara and despite a lack of education, found a way to realize his dream of building a luxury resort in the desert.